MERRY CHRISTMAS! Best wishes for the most wonderful time of the year. 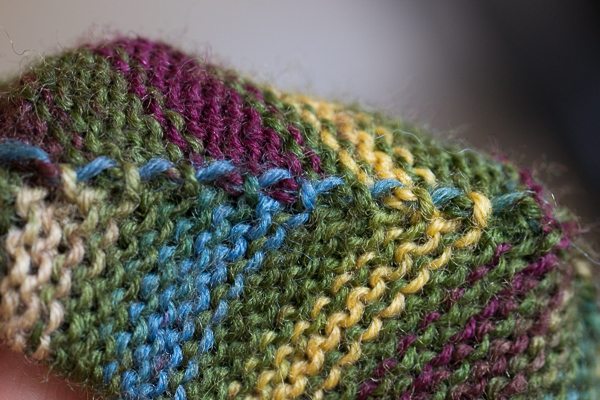 I found a neat way to knit the toes without holes and bunny ears. 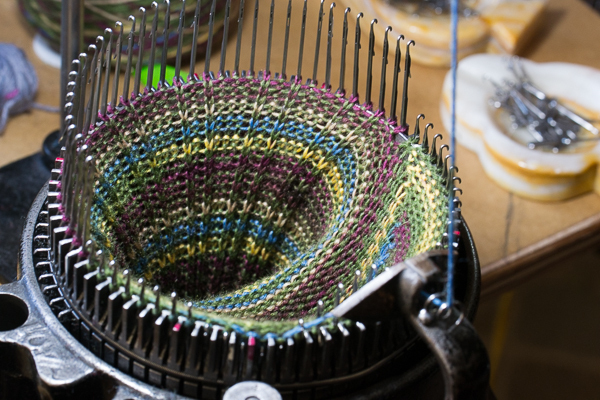 I learned to knit on a sock machine from YouTube videos and the demo shows that after the short rows for the toes are completed, the back needles are pushed down and one more row is cranked for good measure. This extra row will make a hump, add side bulk and hence bunny ears. I knew that isn’t necessary but the last row closes the short row wraps to eliminate the side holes. To avoid this problem, some folks sew the first few stitches together and my solution thus far is to crank 1/2 row to close the wrap and settle with 1/2 the bulk. But I found a better way. Most of us make the toes exactly the same as the heel. But you don’t have to. 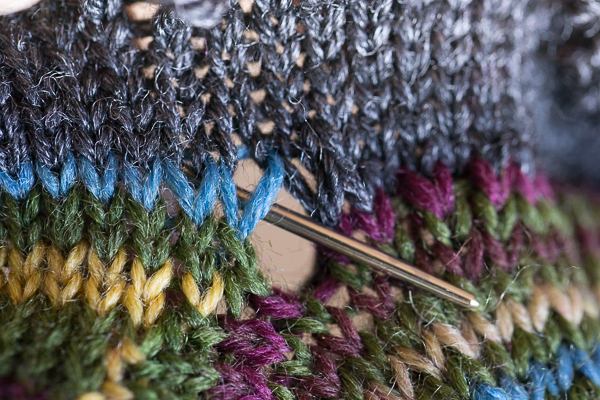 Holes at the side heels should be avoided and there are many ways to do that including pushing two needles down at the beginning of the heel or hitching a loop to the last stitch at the end of the heel. But do you really need to do that for the toes? Not really. Before the tutorial, I would like to thank the Sockophone player’s blog about teepees and hills. 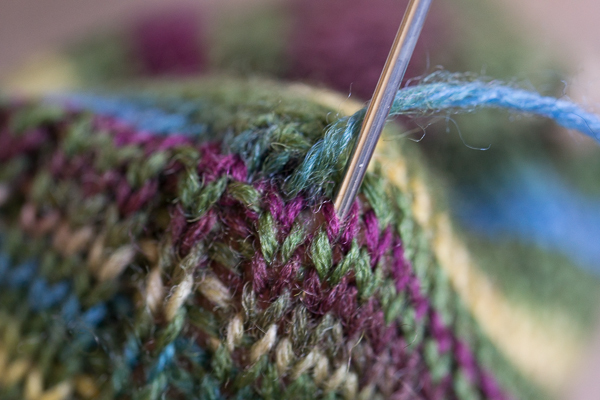 I used to do the Kitchener stitch to graft the toes but this is WAY better. At the beginning of the toes where the yarn carrier is at the back with 1/2 the needles raised, commence the toes by pushing only 1 needle down at the right and crank to the left. Do the same the other side and repeat. 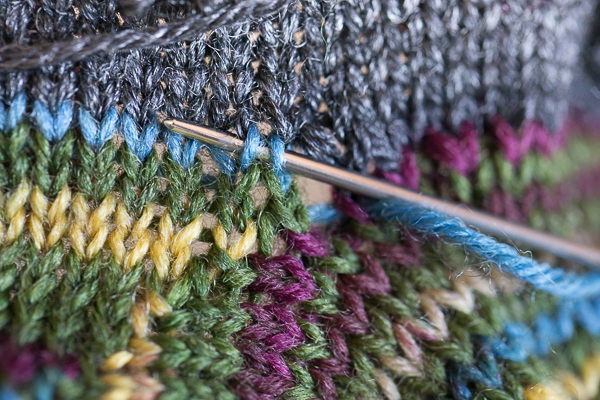 Do short rows for the toes and finish the toes with the yarn carrier in the front. Follow the images below. BTW, these images were taken by a Tamron 60mm f/2. It’s a great portrait lens as well as a fantastic macro lens. When taking macro shots, I set the focus to manual and move ever slightly to get a sharp image. 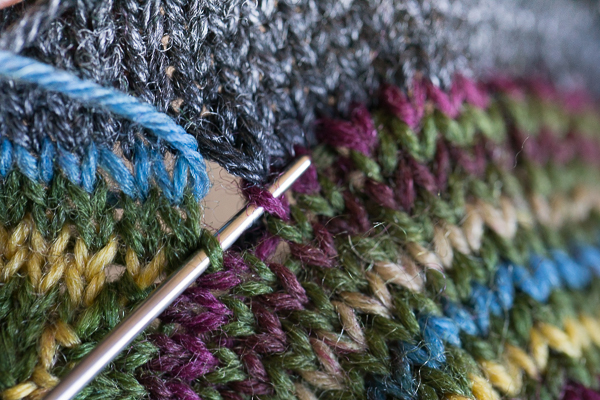 Stop with the yarn carrier in the front and push the back needles down. Crank to the last stitch. 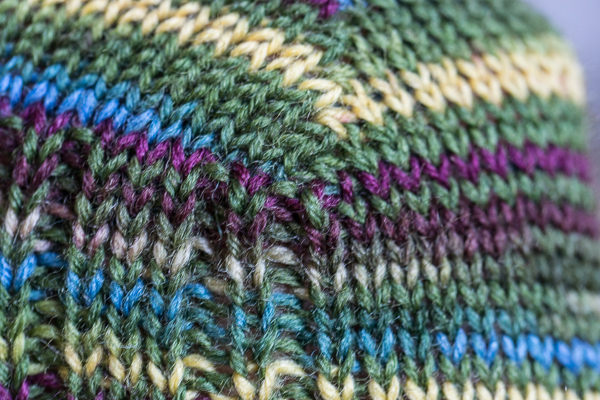 Notice hole between last and first stitch. It’s all good. 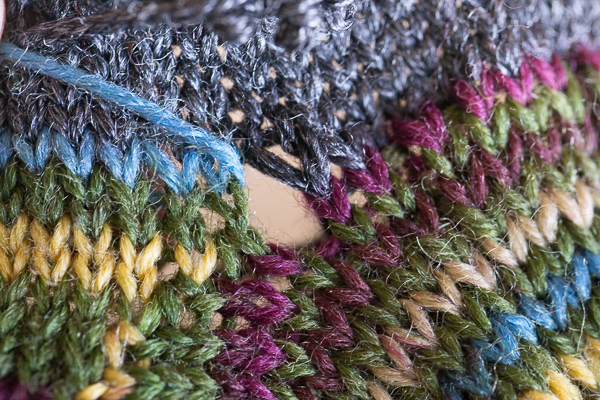 Switch to waste yarn (black) and knit a few rows. Cut waste yarn and remove work. 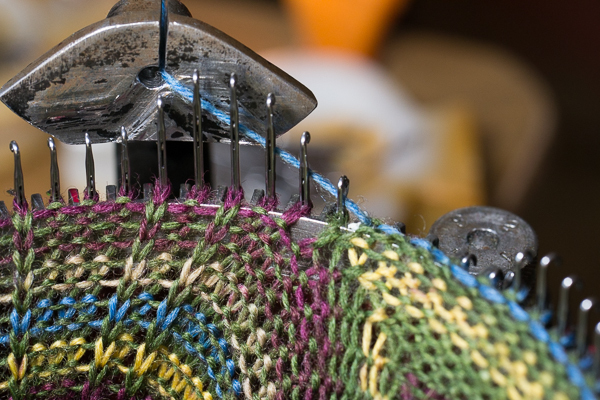 Thread working yarn with darning needle and pull through hole. 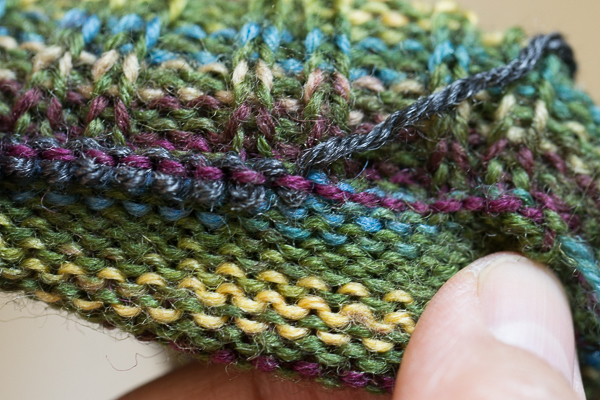 Find the stitch underneath this loop and pick up this stitch. 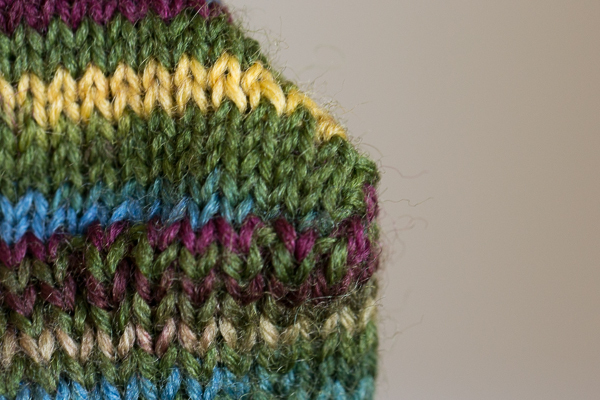 …along with the first stitch in the front. The first teepee! Swing to the back and darn through another teepee. Pick up the teepees at the front and back until you reach the last teepee at the back of the sock. Last teepee at the front of the sock. 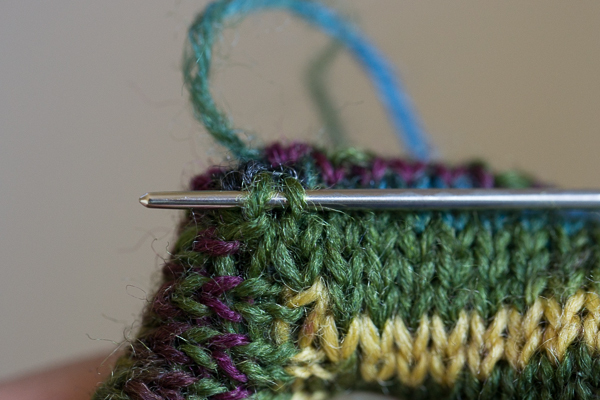 Shove needle through the last loop to the inside of the sock. 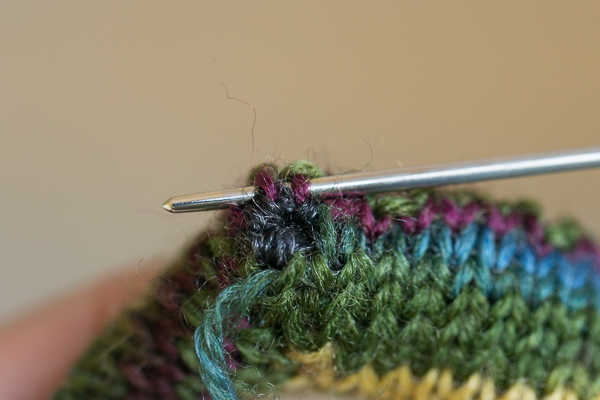 Thread the tail through the short row loops inside the sock. This entry was posted in CSM, Knit and tagged CSM, sock machine. Bookmark the permalink. Thanks for the great tutorial. Love, love, love your pics. A rookie question, when you are doing the increase I’m assuming you are going one up and two down and when you are one the right at the half mark you don’t raise the one but lower the two on the left, crank to the left then crank to the front and then lower the back needles? Also, unfortunately the tee pees and hills blog isn’t available now that she switched sites so I just asked her if she would re-post. Again, thank you for your posts! You’re correct that the Sockophone player has moved back to his original blog and I also asked him to archive this posts. It would be a loss if the teepees and hills posts will not be around for reference. For short rows increase, I switched from wrapping to one-up-two down and now back to wrapping just because sometime I had to run off in the middle of the short rows and when I resume work, I haven’t a clue about my next step. Your description sounds about right. 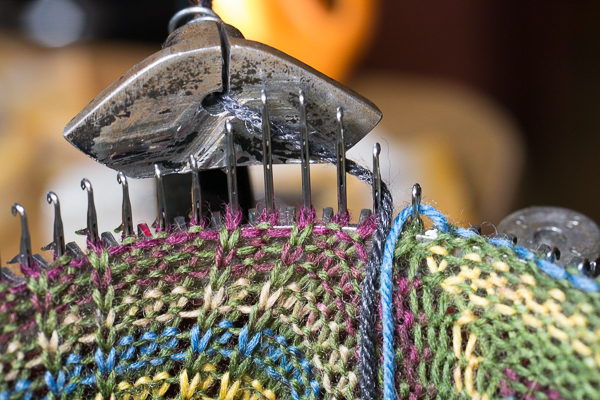 Just make sure that you only push one down at the beginning of your short rows and for the last row (cranking from left to right) stop half way at the front of the machine, push the needles in the back down, and crank slowly to finish the last row. 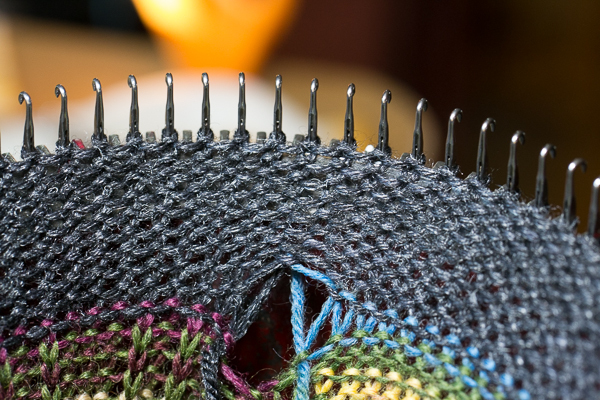 Switch out the working yarn, leaving an arm length to graft later and use the waste yarn to knit starting with the back needles that you just pushed down.